Seahan has two megalithic cairns on its summit. Liam Price noted that Seahan appears on the Down Survey maps as Seavick na bantree and rightly interpreted this as Ir. Suidhe Mhic na Baintrighe, 'seat of the widow's son'. However, he believed that the story behind the name would never be understood: This curious name must have some reference to old traditions about the ancient burial cairns which crown the top of this mountain. All such traditions about this place have long ago disappeared (The Antiquities and Place Names of South County Dublin, Dublin Historical Record, vol. ii, no. 4, 121-33). While the precise story may never be recovered, it should be noted that Mac na Baintrí, the widow's son, is a common figure in Irish folktales whose characteristics are eternal persistence and ingenuity in the face of adversity. Seahan is the 205th highest place in Ireland. Seahan is the third highest point in county Dublin. Picture from mcrtchly : Defender or foe of the Mountainviewers? Picture: Defender or foe of the Mountainviewers? May the (gale) force be with ye! Twenty five years ago I climbed Seahan on a cold winter’s day when the ground was covered in snow and the wind gave an almost arctic feel. The route taken that day was as described in the “Irish Walk Guides – East”. We decided to follow the route again last Sunday (the day of first incoming major storm of the winter). The route starts at the junction of the R114 with the road to Glenasmole at O08193 23076 D where there is a small pull-in suitable for a few cars. The original route passed through a gate on the south side of the junction and steeply up a field. Here we found our first obstacle which was a bracken and bramble covered slope. We declined a tussle with the vegetation and head off towards the SE along the Glenasmole road for about 300m until a forest road is met. This forest road was taken through mature woodland in a SE direction for about 700m to a switch back at O08545 22469 E. Soon after this the forest road peters out and a boundary is encountered with newer forestry to the west. This forestry wasn’t here on my last visit 25 years ago. A small cairn at O08332 22687 F makes an indistinct break in the forestry which leads uphill in a SW direction. Soon the break disappeared and we were forced to fight through the under storey of trees to eventually reach the top of Slievenabawnoge hill (O08068 22569 G). Another break in the trees headed off in a SSE direction to met an area of recent clear felled trees. This presented a new challenge of crossing piles of fallen branches and tree roots left after the felling until another stand of mature forestry was met. Now there was clear path along the side of the forestry heading uphill towards Seahan. Off-road motorbikes had been here before and churned up the path into a muddy wallow all the way to the top. Our fight to the summit of Seahan by the chosen route was accompanied by increasing winds as the day wore on and the deep frontal depression approached Ireland. The summit of Seahan has a number of burial tombs which we believed to date from Neolithic times. Our assumption of their age was challenged by an ominous presence on the summit trig point – Darth Vader himself!. Resplendent with a glowing red ‘light’ sabre pointing to the north. Is Seahan some form of portal to Tatooine (Darth Vader’s home planet)?. Or perhaps he is warding off hillwalking invaders from the North?. 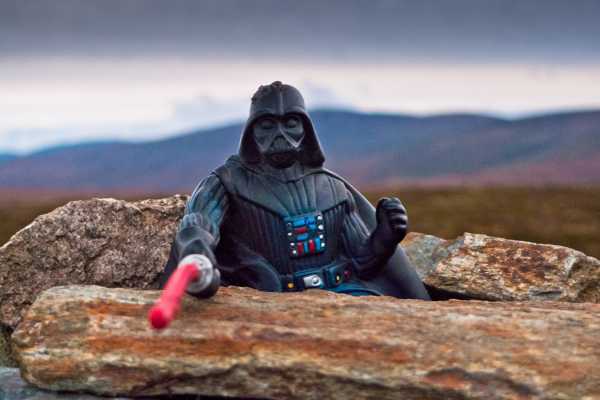 We wait to see what happens in the next sequel/prequel of Star Wars – perhaps the Wicklow Mountains will be the battle ground between the Rebel Alliance (Mountainviewers) and the Empire (Mountaineering I…..). Following our encounter with Darth Vader (and a quick traverse to Corrig and back) we beat a hasty retreat down back to the car pursued by now near gale force winds (MAY THE FORCE BE WITH YOU).